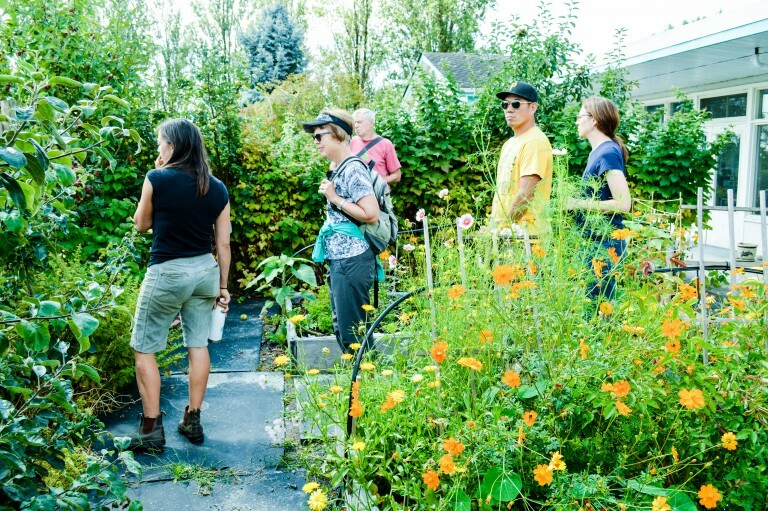 On August 13th, 2017, Farmers on 57th hosted Vancouver Urban Farming Society and a keen group of urban farmers and gardeners for a tour and a discussion of cover crops. 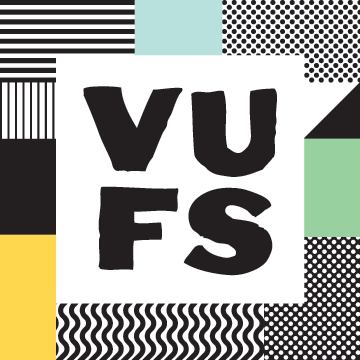 Thanks to Karen Ageson, Farmers on 57th Market Farmer, and Art Bomke of SPEC and the UBC Faculty of Land and Food Systems for their insights on incorporating cover crops into our growing practices! 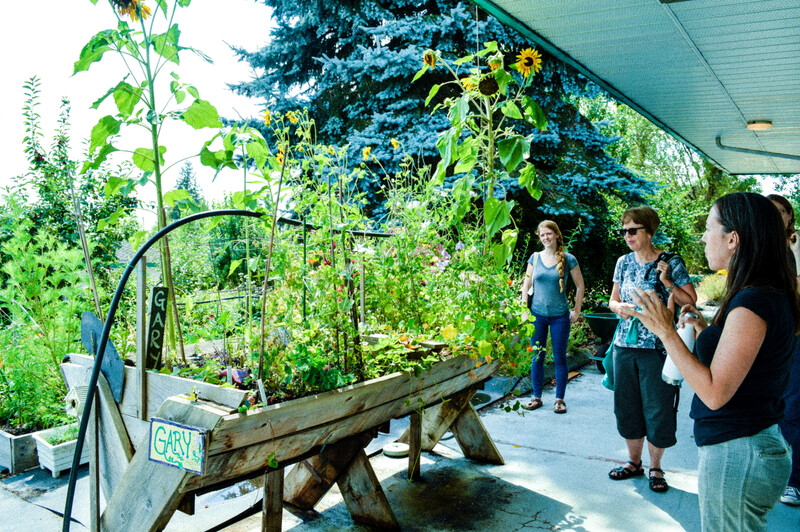 Farmers on 57th is located on the grounds of the George Pearson Centre, which is home to over 100 residents with a range of physical disabilities. 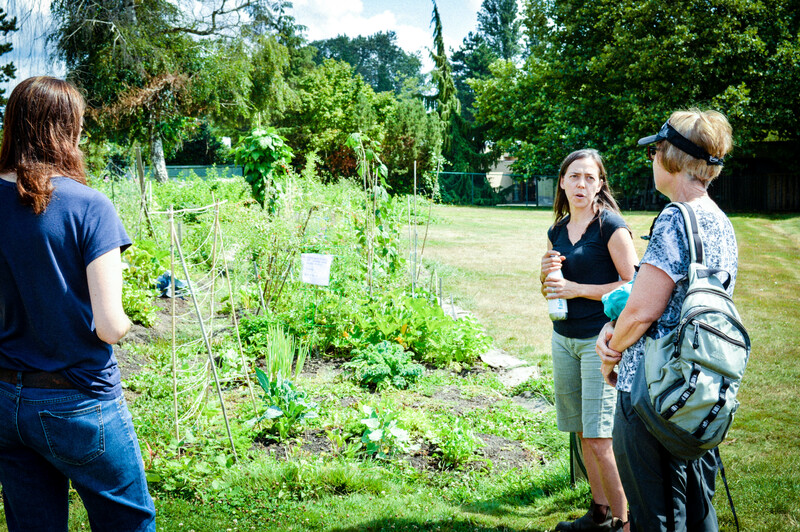 Karen kicked off the tour by leading us through the therapeutic garden plots behind the facility. 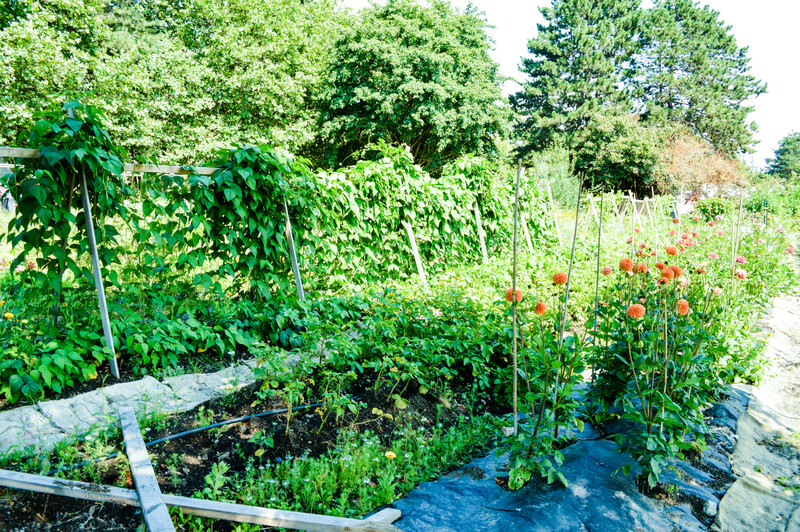 This part of the farm features a weekly gardening program for Pearson residents and other community members, wheelchair accessible beds, fruit trees, and medicinal plants such as comfrey for salve-making. Exploring a wheelchair-accessible garden bed in the therapeutic garden. 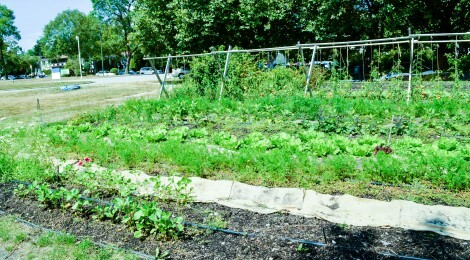 Exploring more of the therapeutic garden plots. The market garden, located on the east grounds of the facility, grows food and flowers for Community Supported Agriculture members who have signed up for weekly harvest boxes and flower shares. A row of teaching plots extends along the farm’s south side. These plots are for gardeners who are learning to grow their own food, an educational program that adds to the farm’s revenue stream. Karen introducing us to the educational plots, where community members learn to grow food. Both flower and food crops grow at Farmers on 57th. Among the many benefits of planting cover crops are to improve soil fertility and structure, protect soil from erosion, improve drainage, and suppress weeds. Karen explained that planting legumes such as vetch and clover are great for adding nitrogen to the soil, whereas grasses such as rye and buckwheat can increase biomass and improve soil structure. Integrated into Karen’s row of tomatoes is a vetch cover crop (vetch, like all legumes, is great for fixing nitrogen in the soil). Karen started the vetch in the spring, dug it out and chopped it up with a shovel just before she planted tomatoes. She pointed out the important step of watering the chopped-up vetch from above to help it break down – her vetch has re-rooted and is now growing alongside the tomatoes as a result of using drip tape. 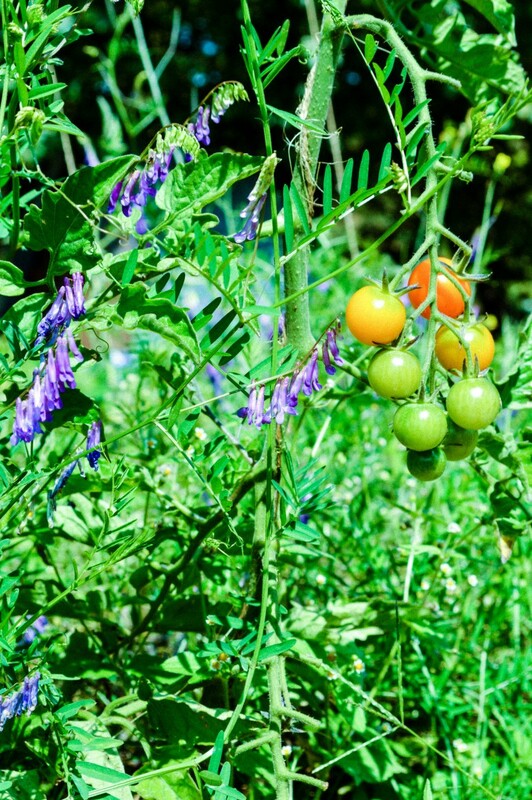 Tomatoes and vetch growing together. Art Bomke introduced us to his urban farmer cover crop mix, consisting of winter wheat, vetch, and peas. According to Art, because urban farmers do many tasks by hand as opposed to using big farm machinery, we have to be careful of sowing cover crops that are too labour intensive. Fall rye, for example, while great for creating biomass and improving soil structure, grows very tall and makes a dense root mat that is difficult to manage when working on a small scale. Winter wheat, on the other hand, is a more urban farmer-friendly crop that provides good organic matter when it is chopped and turned into the soil. Legume cover crops such as vetch, clover, and field peas are a great choice when you need a crop that breaks down quickly and gets nitrogen into your soil. Within one month of being chopped down and turned into the soil, the nitrogen from legumes will be available to your plants. A good legume tip is to pull up a sample and look for nodules in the roots, which indicate that the plant is doing its job of fixing nitrogen. If you don’t see root nodules, it likely means that your soil is likely already nitrogen-rich! Inoculate your legume seeds in a Rhizobium powder before cover cropping to boost their nitrogen-fixing power. When ready to harvest cover crops, cut them down with a shovel or a sharp hoe and flatten them onto the soil. Leave them like this for one week, then incorporate them into the soil with a spade.